This is a new and unique service with benefits at multiple levels. MACHINE SUPPLY, MAINTENANCE, COLLECTION AND CLEANING.........All for a low monthly flat service fee. The Bottle Crusher machine has a stylish and contemporary design, is compact and unbelievably quiet so it can be positioned in the bar, maximising the benefits: eliminating lifting, noise, contact with broken bottles and saving lots of space. 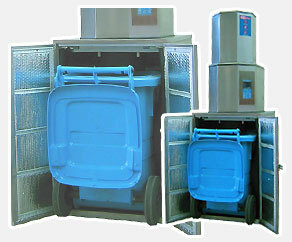 The average content of 10 bar bins will now fit into one compact, easy to roll out wheelie bin. Crushing empty glass bottles means an 80% reduction in empties storage and bottle pick-up. It also saves time. Positioned in the bar area or in a strategic location it will keep bar staff behind the bar, serving drinks and keeping customers happy. The Bottle Crusher is easy and safe to use and OH&S Approved because it eliminates lifting, tipping and reduces employee risk associated with handling glass or broken bottles. For premises using Bottle Crusher, noise generated by glass handling is no longer an issue for your customers and staff. And it also means the end to potential complaints by neigbours about the bottle noise related to bin tipping and collection at 5 o'clock in the morning. And perhaps at the end of a busy night you can put your (crushed) empties outside again. More than 80% of glass collected by Bottlecycler is used in the production of new glass containers. The rest is used in alternative applications such as cement or sandblasting material. Currently a meager 10% of bottles from the hospitality industry is being recycled into new bottles. The rest ends up in landfill or in less valuable alternative applications. Inefficient collection and cross contamination are the main reasons for this alarmly low recycling rate but the BottleCycler's on-site 'pre beneficiation' process will improve this; dedicated trucks, collecting BottleCycler glass only so avoiding any contamination combined with an improved collection efficiency is resulting in a clean recyclable material. Started four years ago when two Dutchmen, Hans van Schoonhoven and Hendrik van Rhijn in Melbourne and Sydney joined forces to utilise an European idea of on-site glass crushing. Main objectives where to design and market a reliable, customer friendly machine as the major component of a full service model. Best New Hospitality Product at the 2004 International Fine Food Show, Finalist at the OH&S awards in Victoria and Episode Winner on the ABC show The New Inventors. The company now has 8 full time staff and concentrates mainly on Melbourne and Sydney Metro, offering a full service package. The clients receive the equipment, including bins and bin handles, weekly glass collection and monthly machine maintenance and bin cleaning. Visy Glass Recycling with it's high tech laser color sorting plants are the primary glass supplier for O.I. Glass Packaging (f.k.a. ACI). Visy is able to guarantee a consistent quality of the recyclable glass particles and they approved our crushed glass and endorsed the total concept. With the National Packaging Covenant becoming a more and more tangible force in the industry, stake holders are more dedicated and feeling more responsible towards an industry effort to increase the recycling rates. BottleCycler fits in perfectly.